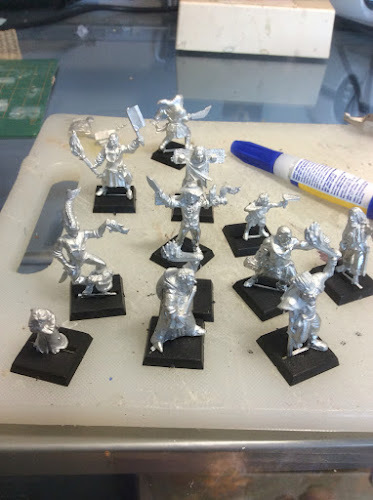 The other evening I was rummaging through the drawers in one of the Dunn-geon cabinets, and I found an unopened box of Mordheim "Frenzied Mob". This was a set GW released in about 2004-05 by Direct Order only. Checking out eBay I see that it goes for quite a high price - particularly in a pristine state. However I knew I bought it for a reason and now that reason has eventuated! I am going to use the figures to populate the various buildings I've made and painted over the past few years. These are a great group of figures. There is the local butcher with a string of sausages around his neck. The guy with the fish on his head - fish were a Mordheim in-joke. A scarecrow, a sullen girl, boy with catapult, two Blacksmiths, a thief, the one legged man ...it goes on. Last night I stripped the flash and mould lines and tonight I'll prime them. Then it's painting them in groups to have them ready for the various buildings. So if you are playing at the Dunn-geon in coming months, have a look at the building on the table. You may get a surprise. Lovely set of figures Pete. I have never seen this particular set. I have most of the other GW Mordheim sets. (Bit of a sucker for the game); in fact playing the PC Game at the moment. Please post 'em when you're done painting. Would love to see them.